Prototype: German Railroad, Inc. (DB AG) "CONNY" general-purpose locomotive, road number 218 460-4, West Franconian Railroad regional service. Diesel hydraulic locomotive with roof version to accommodate the MTU 16V 4000 R40 motor. With offset exhaust hoods. 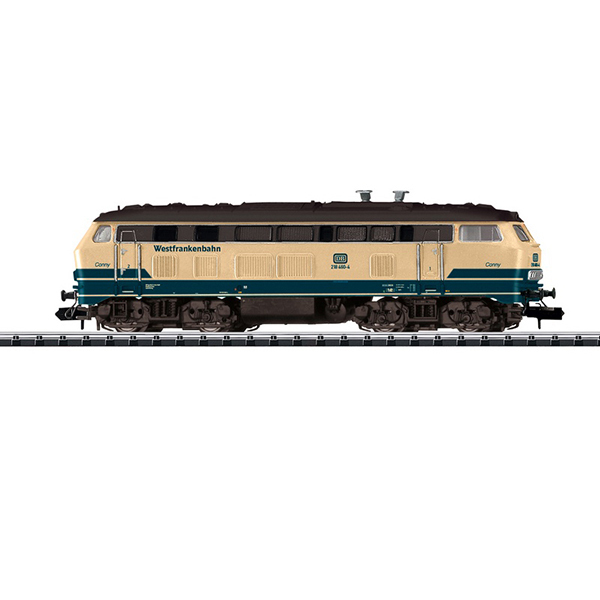 Model: The locomotive has tooling changes and a new version of the roof to represent correctly the offset exhaust hoods on road number 218 460-4. It also has a built-in digital decoder and sound generator for operation with DCC and Selectrix. The motor includes a flywheel. 4 axles powered. Traction tires. The headlights and marker lights change over with the direction of travel. Warm white LEDs are used for the lighting. The cabs have lighting that can be controlled digitally. The locomotive has a close coupler mechanism. The headlights and marker lights change over with the direction of travel in analog operation. The locomotive has separately applied grab irons. Length over the buffers 102 mm / 4".